A delegation, led by Teodorin Obiang Mang, the son of Equatorial Guinea’s president, has been detained by federal police and revenue authorities in Brazil last weekend after they arrived in the South American country with over $1.4 million cash and watches worth $15 million. According to the Brazilian newspaper globo.com, the 11-man delegation arrived in Brazil on Friday on a government aircraft but was not on a diplomatic mission. The news portal reported that the money and watches were in two suitcases. In total, the delegation carried 19 suitcases, in addition to a diplomatic baggage, whose contents were not subject to disclosure. Teodorin, who is also vice-president of the oil-rich Central African country, was exempted from questioning due to his diplomatic status. 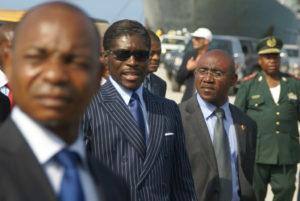 The Embassy of Equatorial Guinea in Brazil in a statement quoted by local news portals said the vice-president was in Brazil for medical treatment. They said the money he brought along was to be used on a later trip to Singapore whiles the watches were for his personal use. Teodorin Obiang Mang – the eldest son of President Teodoro Obiang Nguema Mbasogo – was tried in absentia in France last year and also given a suspended fine of €30m for embezzlement, money-laundering, corruption and abuse of trust. The French court demanded the confiscation of assets including Obiang’s €107m mansion near the Champs-Élysées, which boasts a hammam, disco, gym, hair-dressing studio, gold-plated taps and hundreds of artworks. Teodorin Obiang Mang owned two Bugatti Veyrons, the most expensive and fastest street car in the world, costing about €1m a piece and capable of reaching 250 mph. The Golden Boy’s lifestyle was in stark contrast with that of ordinary people in Equatorial Guinea, where over half the population lives on less than €1.65 a day. Posted by Steven Addamah on September 18, 2018. Filed under Zoom. You can follow any responses to this entry through the RSS 2.0. Both comments and pings are currently closed.